If there’s one thing I faced every time I strapped into an F-16 in combat – it’s fear. Fear of getting shot down…becoming a prisoner of war…letting down my team. They were all obstacles and adversities. But the biggest obstacles weren’t the missiles launched on my aircraft. They were the missiles in my mind. Three years into my flying career, I almost died in a scuba diving accident. 35 feet under water, my mask malfunctioned and I inhaled a lungful of burning salt water. I’ll never forget choking into the mask, gasping for air and trying to clear my lungs. I had a panic attack and almost died. It was the worst experience of my life. No combat mission came close to the fear I had that day. The result? I developed claustrophobia. (Not the best thing for a fighter pilot to have!) And for the rest of my career, I suffered panic attacks that often robbed me of the joy I had for flying. But I never quit. It wasn’t easy, and I never let the fear defeat me. Ultimately, I learned to break through my fear barrier and eventually became a highly decorated fighter pilot with over 65 combat missions. Obstacles, adversity, and fear are part of business and life. It’s not a matter if they will be launched at us, but when. Layoffs. Divorce. Debt. The loss of a major sale…or most importantly, the loss of a loved one. They are all obstacles. But I prefer to call them challenges. To beat them, and eventually win your life missions, requires perseverance, resilience, and most of all, courage. 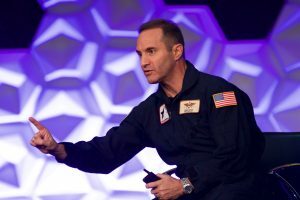 In my years of flying, along with coaching leaders and entrepreneurs on personal growth, I’ve discovered five powerful tactics that helped me to overcome obstacles and achieve breakthroughs. Individually they may not be enough to conquer fear. But together, they may just be what you need to reach new heights. Being fearless sounds cool, but it’s cliché and unreasonable. It denies you of your humanity and puts rose colored classes around your challenges. The more I tried to be fearless and resist my claustrophobia, the more it overcame me. As the saying goes, “what resists, persists.” When I acknowledged my fear and used it as an ally, I became more humble. Humility makes you realize that you’re not invincible and that you don’t have all the answers. Fear screams – “it’s time for you to grow!” and taps into a more powerful emotion that elicits positive action…courage. When I first dealt with my claustrophobia, I learned all I could about it including reading actual case studies. What tools did people use to overcome it? What worked? What didn’t? While it didn’t help 100%, it helped prepare me to face my fears with more confidence. Confidence builds Courage and Courage crushes Fear. When obstacles arise, get smarter! Outwork your fear. Develop new skills. Take a course on communication or sales. Start a new fitness program. Hire a coach. Improve your perspective. By doing so, you’ll develop a cache of weapons to shoot down obstacles with confidence. In combat, nothing diminished my fear more than knowing that if things went wrong, my wingmen would back me up. Relationships are crucial when dealing with obstacles, but the key is to build relationships before the obstacles come. Appreciate your friends and co-workers by giving them advice, support, and your time and in return, they will be there for you to cheer you on and encourage you. Knowing that you have wingmen to go to for help and who will lend you their wings, is a great way to dissipate fear and face obstacles with courage. The missiles of fear will blind you of your dreams and put you in survival mode. You’ll lose sight of your mission objective – the target. Survivors focus on threats. Winners focus on targets. Don’t lose sight of what it is that you’re really fighting for – your dream home, the new position, your customer, or your future partner. It will help you stay resilient. Imagine the feeling of landing your jet and accomplishing your goal. It will reignite the fuel to your passion. Fear normally increases when you’re focused only on yourself. It is only when you shift that focus to those who need you – those who you can serve – that it loses its power. 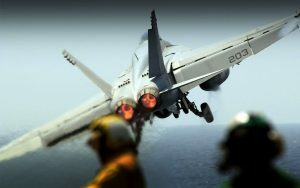 Fear normally diminishes when you have what I call, “meaning in your mission.” This is the essence of servant leadership, and is why I always had my head out of the cockpit and kept sight of my wingmen (especially in combat.) As long as I was needed, I had a reason to keep fighting. When the weight of your obstacles seems too much to bear, remember who needs you to win. Who can you inspire, encourage, support, or coach? Who needs to return home? Who do you love? When you tap into that, it will give meaning to your mission and you’ll keep taking action despite adversity and fear. You are on a mission to win. Don’t allow the winds of change or the turbulence of fear push you off course. Fly your aircraft. Keep sight of the target. For on the opposite side of fear, is growth.